Der KV-5 ist ein sowjetischer premium schwerer Panzer der Stufe 8. Die Entwicklung wurde Juni 1941 im Leningrader Kirowwerk aufgenommen und bis August fertig gestellt, die Pläne wurden jedoch durch die komplizierte Lage an der Front vereitelt. Der KV-5 sollte einige Bauteile des KV-1 weiter verwenden. Es wurde ein neuer Turm mit dem 107-mm-Geschütz ZIS-6 entwickelt. Zwei Laufräder und eine Stützrolle wurden auf jeder Seite hinzugefügt. Ein neuer 1.200-PS-Dieselmotor wurde für das Fahrzeug entwickelt, wurde jedoch nicht rechtzeitig fertig und wurde durch zwei V-2K-Motoren ersetzt. 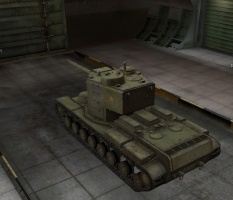 This tank is known as a stronk tank and for its enormous hull and turret armor which are strong amongst all the premium tanks, but it lacks a proper cannon for its tier. Even more so than the other KVs, it's a lumbering beast with a pitifully slow turret traverse rate. However, it is also extremely heavy and thus ramming other tanks is a very viable strategy in close-quarter combat (though you'll need a bit of space to get up to speed). There are many weak spots on this tank that an experienced player can target to inflict heavy damage, but even so the sheer amount of HP can carry it through a lot of battles. 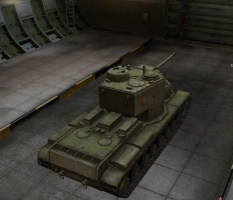 In short, the KV-5 is an excellent steel wall/roadblock that can soak up damage for your teammates, but due to its lack of firepower, it's better equipped to be a support tank than a spearhead. 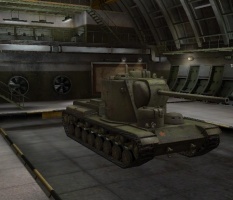 This tank was removed from the in game store with the introduction of version 0.7.5. It last appeared in the NA server gift shop in April 2016, as part of the WoT 5th anniversary specials. 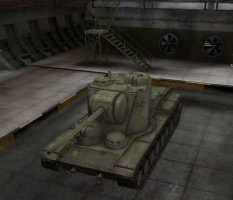 On the EU server, it last appeared in the giftshop during Tankfest 2015 (June 2015). The "R2D2" Mini turret is a large and very thin weak spot, also has many other weak spots. Very sluggish hull and turret traverse ( Will lose speed significantly if turning ). Despite its enormous weight, the tank is able to reach a good speed for a heavy tank. This makes the KV-5 an excellent ramming tank. The 107 mm gun ZIS-6M gun is effective, although the penetration is poor for its tier. The use of APCR ammunition is recommended. 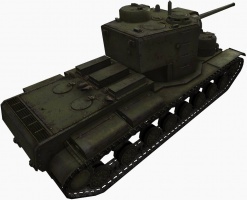 Its high rate of fire and fairly quick aim time can make the KV-5 a stark contrast to other KV-series tanks that players encounter. In addition, the shells are cheaper than those of its counterparts. If possible, try to remain at medium to long distances from the enemy. The greater the distance, the more difficult for the enemy to penetrate your armor. The low turret traverse means you will have a hard time bringing your gun to bear at close ranges. However, if you get surprised by an enemy who's already close to you, don't stop. Ram. Stick close to your allies. Since the enemies would be aiming for your weaker allies, you could already possibly get the enemy before they can even get a shot on you. Cover your vulnerabilities, especially the two small turrets on the front of your hull, and also the commander's cupola. Versus tanks of the same tier or higher, the side armor is penetrable. Try to angle your tank towards the enemy. Stopping for a long time is fatal. You should move back and forth all the time to make it harder for the enemy to take aim. When enemies do get within short range, the KV-5 is perfect for ramming due to its heavy weight and excellent maximum speed. For example, going downhill at full speed, the KV-5 can easily destroy tier 7 medium tanks, using a combination of "shoot, charge, ram, then a second (kill) shot." Ramming heavy tanks may not be as beneficial, but is often part of any short-range attack. Due to the weak armor penetration of the 107mm ZIS-6M, it is advised to know the weak spots of the enemy tanks you are facing (Lower plate and cupola are usually the most reliable and easy to hit weak spots). 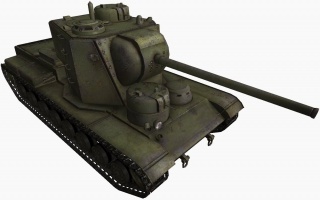 The high profile of the KV-5 allows you to shoot over low-profile tanks, such as the IS-3. Use this to support allies by firing over them, or to shoot down on the roof armor of your opponents. There are large weak spots on the hull and turret. So, limit your enemies' access to them, if you are in a city, sidescraping can work well. Sometimes, depending who is firing at you, driving around backwards actually can work, because the maxiumum rear armor of the KV-5 is 20mm more than the Löwe has at the front! So, driving around backwards will not allow shots into your weakspots, but the controls are counter intuitive and only seasoned players should try this, as it is very hard to do well. Do be careful, though, as the upper half of the rear is 90mm flat plate, and is easily penetrated. Work was begun on the KV-5 tank ("Object 225") in June 1941. The talented designer N. Tseits, one of the oldest workers of SKB-2, was named the senior engineer for this vehicle. Also in his group were K. Kuzmin (hull), L. Sychev (turret and gun mount), and N. Fedorchuk (running gear components). 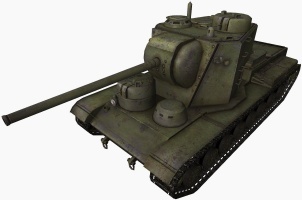 The experience gained in the development of the KV-4 design was weighed during the design of the KV-5. The result was a powerful tank of relatively unusual appearance. The hull of the KV-5 had a height of 0.92 metres. Therefore the driver-mechanic and radio operator-machine gunner received special cupolas that permitted them an adequate sector of view. The rhomboid-shaped turret was of relatively large size. Housed in it were the tank commander, who had a commander's cupola, gunner, and loader. The solid diameter of the ring was 1840 mm and the large internal space of the turret afforded all members of the crew normal working conditions. The tank was heavily armored-150-180 mm. With the beginning of the war, a whole series of collectives entered the project. Thus, the notion of a forged turret was abandoned and replaced by a welded turret design. In view of the absence of a 1200 h.p. diesel engine (it was still in development), the KV-5 was redesigned for the installation of two parallel-mounted conventional V-12 engines. 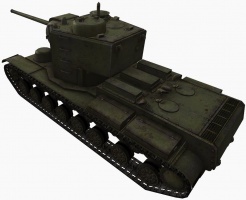 By August 1941 the KV-5 design was practically fully completed, and the production of a number of the tank's components and aggregates was begun. But because of the difficult situation at the front around Leningrad, all experimental work at the Kirov Plant was halted and all efforts were dedicated to increasing the output of production KV tanks. The latest date found in the preserved drawings of the KV-5 is 15 August 1941, when the battle was being fought around Luga and Krasnogvardeysk. The project was eventually canceled in favour of the more advanced Russian heavy tank designs. No prototype was ever constructed due to the Leningrad Blockade.